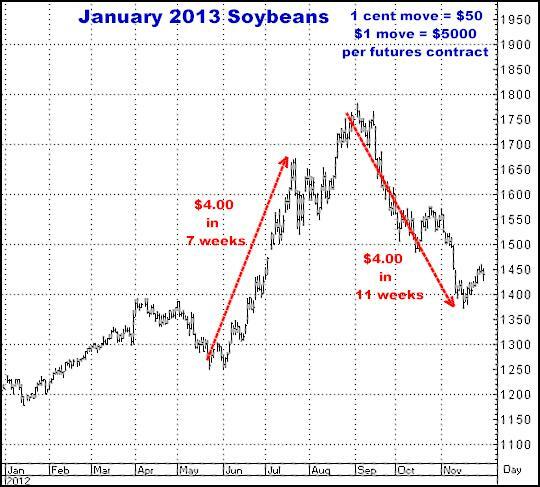 During the past four months I have been recommending Short Corn, Wheat and Soybeans. 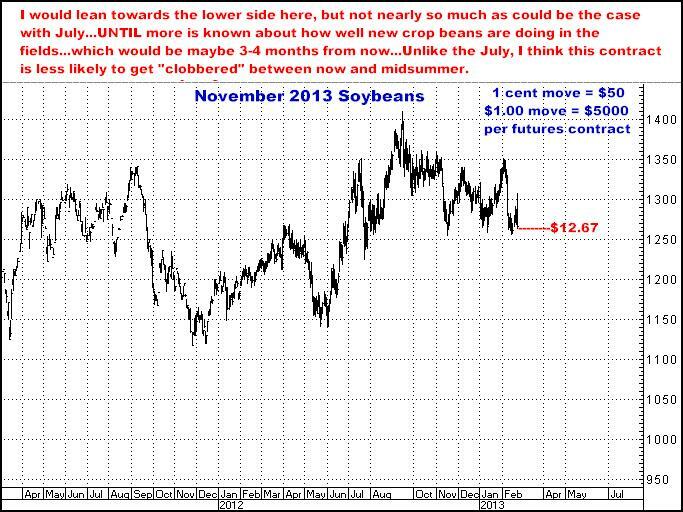 During this time, while Wheat has been trading definitively lower, and Corn has been doing the same ( to a lesser extent), the Soybean market has remained in a sideways pattern, even being able to briefly make new 5 months highs Thursday night…before reversing rather sharply to the downside during Friday’s trading. 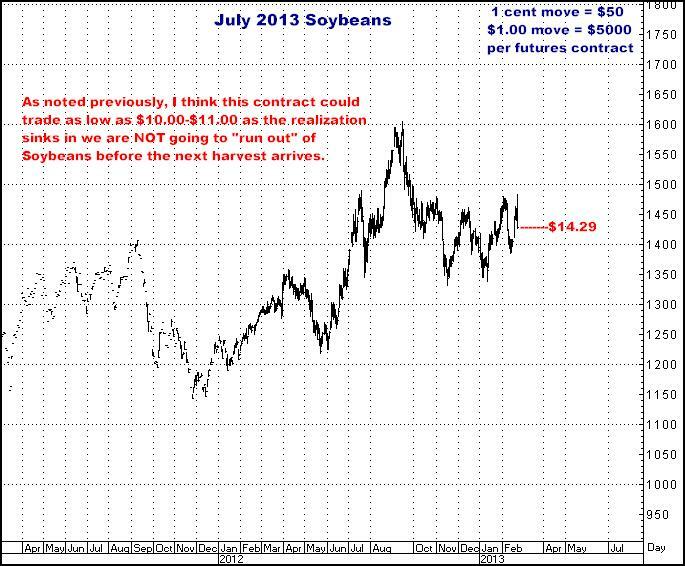 I CONTINUE TO SEE CORN AND WHEAT AS MAJOR SHORTS BUT CURRENTLY BELIEVE THE SOYBEAN MARKET MERITS IMMEDIATE ATTENTION. I MAY BE DEAD WRONG BUT I THINK THE SOYBEAN COMPLEX IS PRIMED TO BEGIN SOME DEGREE OF WHAT I WOULD CALL A “COLLAPSE” OVER THE NEXT 4-6 MONTHS. 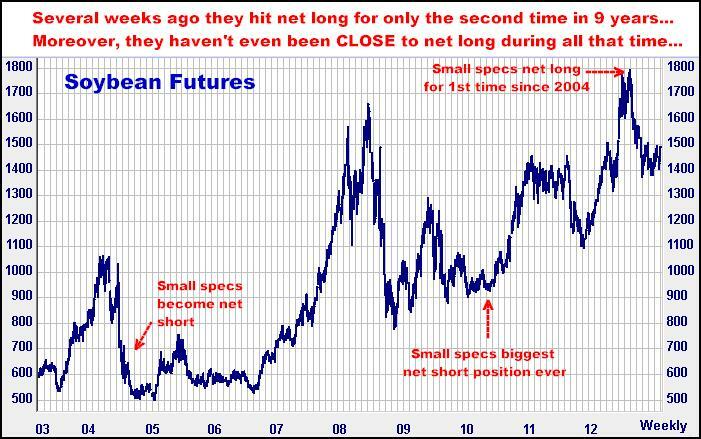 Next in line is a VERY interesting chart…Commitments of Traders, which breaks down how Commercial Traders (hedgers), Large Speculators (funds) and Small Speculators (perennial market fodder) are currently positioned…how Net Long or Net Short each group is at a given moment in time. There is no indicator that EVER gives you an absolute lock on what a market is going to do…They can only give you “clues” as to what might happen, and this all you actually will see here…a clue…But I think it’s MAYBE a big one…And I’m showing you this chart with for one reason only…to point out that SMALL SPECULATORS NOW HAVE THE SMALLEST NET SHORT POSITION IN 9 YEARS. As I was unable to eliminate the other data, you’ll have to look a little closely to trace the BLUE LINE representing SMALL SPECULATORS, but if you take the extra moment to do so, you’ll be able to see that “the little guy” has been net short since early in 2004, and only last September…AT THE VERY TOP OF THE MARKET…did they reach a slight net long position, again, for the 1st time in 9 years…What immediately followed was a virtually straight down $4.00 sell off in Soybeans…And during the 5 months since, they have basically stayed there, as the market has essentially gone sideways…stayed there with the market still at extremely high historical levels and their smallest position in almost a decade. Here’s the bottom line in my opinion…All I hear is tight supplies, bullish weather babble from South America, demand is strong, and, “Oh boy, the Chinese are going to just load up at these record prices”. 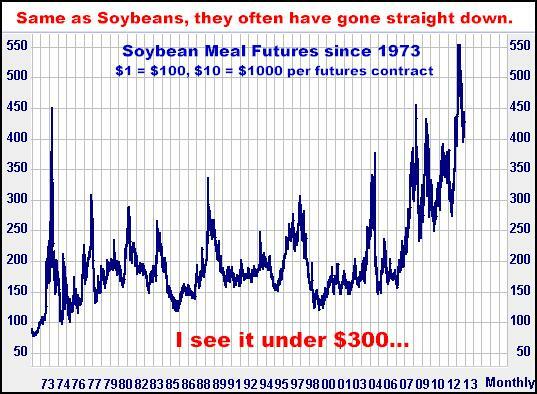 I say that’s all a bunch of bullish bull…I firmly believe all that bullish malarkey has LONG since been built into prices…that anybody who needs Soybeans during the next 6 months has already been scared into buying…that farmers are sitting on heavy percentages of last year’s harvest which they classically didn’t sell $3-$4 higher…and finally, with record acreage in the works around the planet, prices have nowhere to go but down between now and late summer. 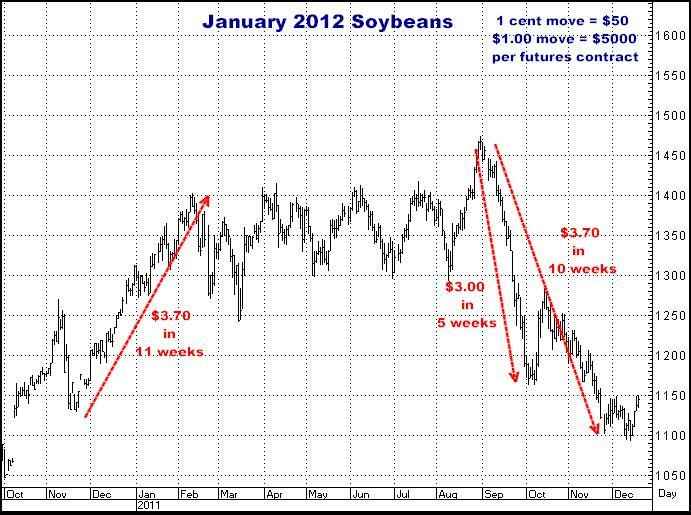 I CONTINUE TO THINK OLD CROP SOYBEANS (EVERY CONTRACT BETWEEN NOW AND AUGUST) ARE AT RISK OF GOING TOTALLY IN THE TANK. BIG HARVESTS ARE MOST LIKELY COMING FROM EVERYWHERE AND THE PERCEIVED “SHORTAGE” IS NOTHING MORE THAN LAST YEAR’S HYPE (when, by the way, soybeans were $3-$4 higher and according to the experts, almost seemingly never going down again). I TRULY BELIEVE WE HAVE A SHOT AT UNDER $10.00 BEFORE JULY GOES OFF THE BOARD. Of late, due to expectations of record acreage around the globe, the idea has been growing among agricultural analysts that, if we get normal weather this year, by next fall we will be facing not shortages, but huge surpluses in Soybeans…and prices for “new crop” (those to arrive in November) will be going down. Apparently however, those same people seem to think this possible surplus 8-9 months in the future will have no effect on prices for “old crop” soybeans (those already in storage) and they therefore remain bullish old crop beans, which is evidenced by the fact July closed Friday at $14.29 a bushel, while November (new crop) closed at $12.67, a difference of $1.62...To clarify, July Soybeans are trading for $1.62 more than November Soybeans. I’m really middle of the road as to my immediate expectations for November Soybeans (I would say sideways to lower if I had to bet…but I don’t have to), but I still feel quite strongly farmers WILL be selling old crop beans, more and more, no matter what the price…as/if they do go in the tank between NOW and summer. 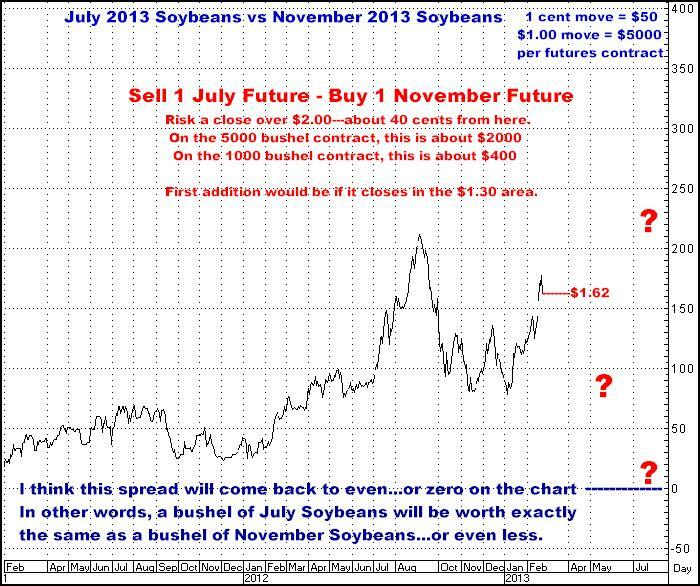 With this in mind, I think taking a short position in the July-November Soybean Spread makes a lot of sense and has substantial profit potential (obviously if I am wrong, it can also lead to substantial losses). This is a futures trade, and if you are unfamiliar with spreads, can be a little confusing, but here are the nuts and bolts on a few charts. Here is the July chart again…I think it is going down…a lot. And here is the November…New Crop. 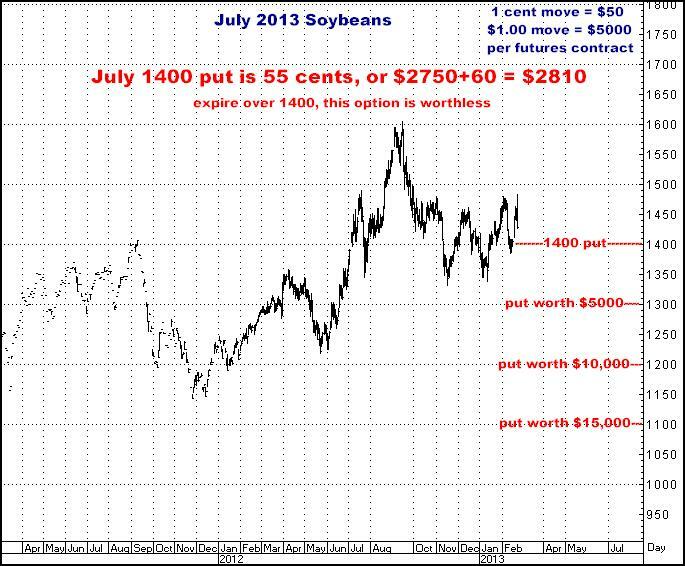 I believe, in the July contract, where just about everything that could be bullishly known, ALREADY IS KNOWN, and has therefore already been LONG since priced into the market...But what hasn’t been accounted for is what happens if prices start falling and farmers HAVE to begin selling to cover cash flow needs for current plantings, as well as to make storage room for next fall's harvest...or more significantly, if all the buzz phrases about "prices have to rise or farmers won't sell', start proving to be BACKWARDS...Believe me, when a farmer sees $70,000 worth of soybeans (1 contract) become $60,000...and then $55,000...there is a moment when fear does get the best of him (we have all been there in trading and this is no different), and his attitude can become, "Just sell them now! "...and when you get a whole agricultural nation in the same frame of mind, the result can be what I've seen a 1000 times in any number of markets...real panic, universal selling...and SHARPLY lower prices…Maybe I am dead wrong. This is just Bill Rhyne’s opinion…but this IS what I am looking for. This is a futures trade and there are various ways to handle it…Including adding to the position if the spread does move higher (the wrong way), the idea being, there are reasons to believe this spread will have to work sooner or later…which can be dangerous thinking which can lead to unexpectedly big losses… but nevertheless, this is more or less the way I see it. 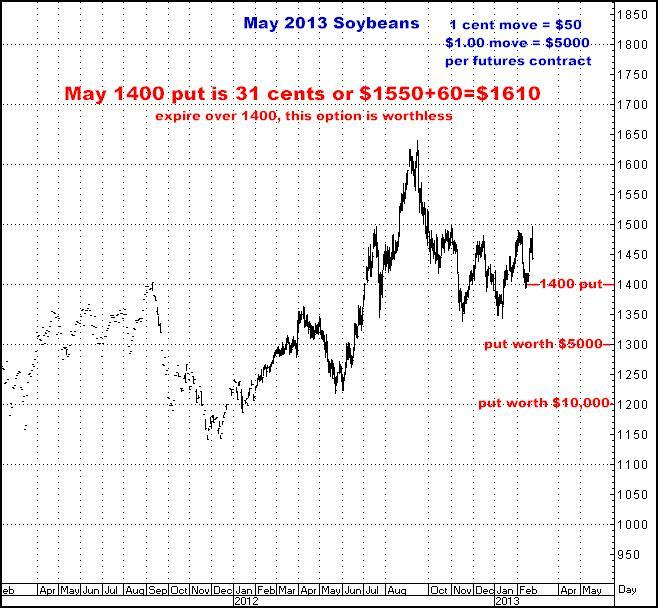 The absolute, however, is I WANT TO BE SHORT OLD CROP SOYBEANS…and am on this trade in any way I can be. 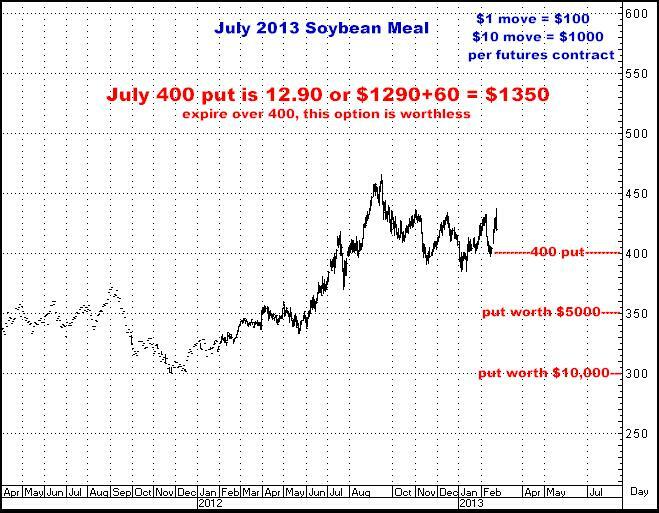 The author of this piece currently trades for his own account and has financial interest in the following derivative products mentioned within: Short Soybeans and Soybean Meal.